As Sarawak’s development accelerates, 1.6 million new jobs will be created, most of them within the SCORE region. The new investors and industries that are attracted to the state will need access to an educated, skilled and motivated workforce, and Sarawak’s ability to offer an ever-growing pool of human capital will be a crucial factor in SCORE’s success. The new jobs and the new emphasis on TVET (technical and vocational education and training) will benefit everybody – from overseas investors to expatriate managers and local families – bringing more money and a better quality of life to the region. The impact of SCORE will double the population and lift Sarawak’s GDP by a factor of five by 2030, raising average incomes to nearly RM100,000. Efforts to develop Sarawak’s human capital are being stepped up to meet the needs of industrial employers in SCORE, especially the manufacturers attracted to the Samalaju Growth Node, where new investment has already generated 6,500 direct operations jobs. More than 17,000 permanent roles will be created in the next three years as investment-led projects come on stream, not to mention the thousands of skilled, semi-skilled and unskilled jobs involved in the construction of major manufacturing facilities. 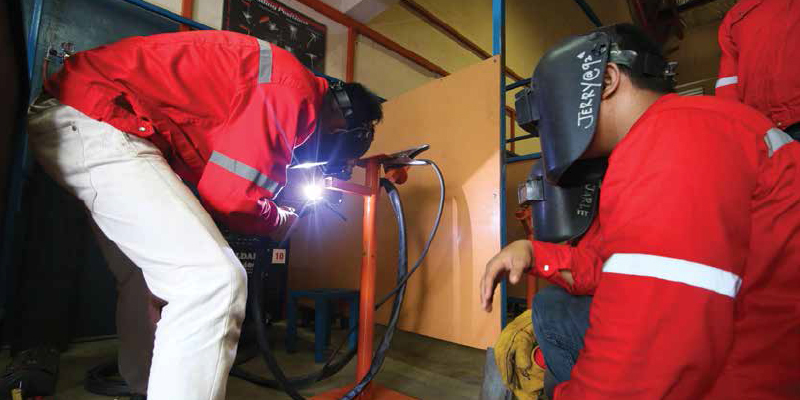 There are now more than 30 TVET institutions in Sarawak, offering 60 degree courses, 164 diploma and foundation courses and 202 certificated training programmes (SKM, modular and short courses) closely related to the specific skills needed in SCORE’s ten priority industries. By 2015, the Workforce Development Unit (WDU) – part of the Chief Minister’s Department – was able to report that 25,762 skilled (degree and diploma) or semi-skilled (certificate course) graduates a year were being trained in the state. Many new institutions have been set up to develop a more technically skilled workforce for the 1.6 million new jobs that are coming to the state, including Bintulu’s Advanced Technology Training Centre (ADTEC), the University College of Technology Sarawak (UCTS) in Sibu, the Centre of Technical Excellence Sarawak (CENTEXS) in Kuching and another CENTEXS campus in Lundu. Three more CENTEXS campuses are being established, and there will also be a new branch of the Sarawak Skills Development Centre in Mukah and a branch of the Construction Industry Development Board’s Akademi Binaan Malaysia in Bintulu. State government agencies like the Sarawak Timber Industry Development Corporation (STIDC) and the Sarawak Craft Council are also working with federal government ministries and local institutions of higher learning to ensure that education and skills are provided where and when they are needed. The Workforce Development Unit has placed great emphasis on building close ties between industries and institutions to guarantee the relevance of the subjects being taught. As a result of this, several key investors are collaborating directly with the institutions to develop special programmes to meet their manpower needs. Sakura Ferroalloys Sdn Bhd is working with ADTEC in Bintulu and Press Metal and CENTEXS are co-operating closely in Kuching, while Tokuyama has taken a different approach, setting up its own in-house training centre to develop exactly the skills it needs. UNIMAS, Universiti Teknologi MARA (UiTM), the Sarawak Skills Development Centre (PPKS), the Kota Samarahan Industrial Training Institute (ILP) and the MARA Skills Institute Kuching (IKM) have already been involved in programmes to meet the needs of the SCORE trigger industries (aluminium, glass, steel, and oil and gas) and of the other priority sectors, such as marine engineering, the palm oil and timber industries, fisheries and aquaculture, agriculture and tourism. As the drive to build a better qualified workforce accelerates, Sarawak is now producing more than 180 graduates a year in each of the key engineering disciplines – chemical, electrical and mechanical – that are needed by manufacturers. UiTM has already launched an innovative Diploma in Halal Management and is planning new diploma courses in herbal production and in aquaculture, while University College of Technology Sarawak offers a Bachelor’s Degree in Food Technology.